Wednesday August 6th 1975: Yogi Berra had been a Mets coach since the 1975 season, after his dismissal as the A.L. New York's club manager in 1964. 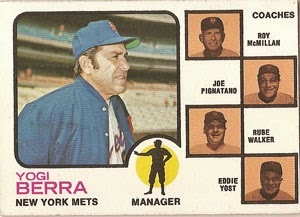 Berra remained a Mets coach until Spring Training 1972. It was at that point he was named Manager of the team after the untimely death of Gil Hodges. Berra was the most popular guy for the job but not the most qualified. Whitey Herzog who was the Mets Minor League Director of Player Development probably should have gotten the job. He had helped bring along all the young talent the team had at that point. In any event Berra, one of New York City's most popular players ever got the position. Although he was very lax, which worked for some, it was a problem for others. He was not the strict disciplinarian Gil Hodges was & it may have hurt the teams chances. In 1973 he was almost let go as the club floundered in last place. But a news paper poll proved that he was the most popular guy who's head was on the chopping block, so he stayed. The club turned it around, mostly due to good defense, timely hitting, an evenly matched NL East & outstanding pitching. Berra's pitching staff was so good it took them to the 1973 World Series. They fell one game short of winning it all after leaving New York up three games to two. Many believe it was Berra's decision to start a tired Jon Matlack on three days rest in Game Six, over a rested George Stone that cost them the Series. 1974 was an overall disaster for the club finishing fifth at 71-91. In 1975 the team got Joe Torre, Del Unser & Dave Kingman to improve offense, but the team was still struggling. Berra had troubles with Cleon Jones who wasn't happy seeing little playing time & demanded the club back him up. It was the first time Berra had ever stood up to upper management & was so firm on a decision. Jones was eventually released but Berra's days were numbered as well. The Mets were hanging tough behind the first place Pirates, but after taking three in Pittsburgh they lost two games there & then lost three straight to the Montreal Expos, falling nine and 1/2 games back. On August 6th, the Mets beat the Expos 9-6 at Shea Stadium, after a sloppy Montreal 7th inning, where they allowed five walks, a hit by pitch & three Mets doubles. The Mets quietly walked off the field & filed into the club house. Soon after, the Mets made the official announcement that they Yogi Berra was dismissed & he would be replaced by Roy McMillan. Mets Chairman M. Donal Grant stated in the press conference that the club was "trying to salvage something from the season". 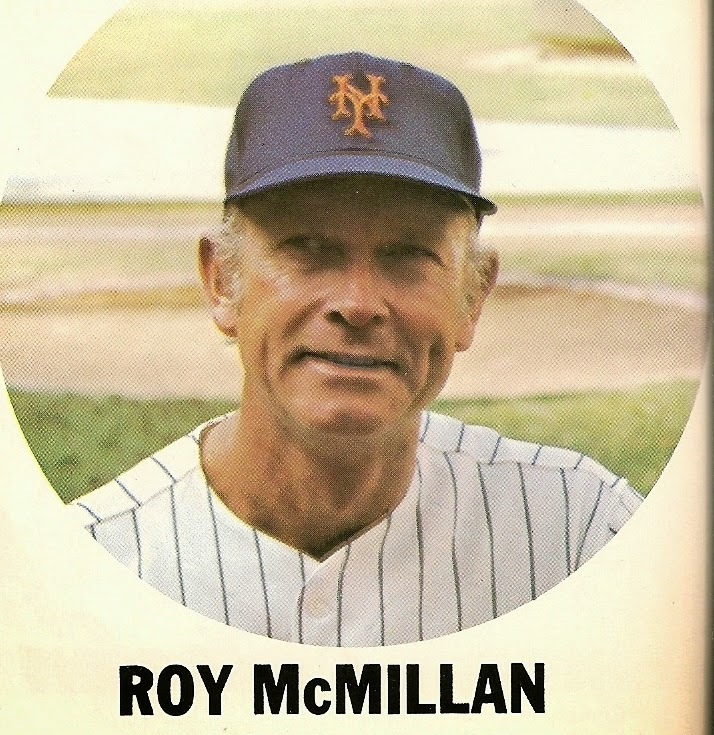 Roy McMillan was a fine defensive short stop who had played 16 seasons, his last three with the New York Mets. McMillan was a tutor to All Star Bud Harrelson who took over the position for the next decade. McMillan 46 at the time, was a Mets coach & agreed to being an interim manager, only for the rest of the season. The Mets finished up at 82-80 in third place 10.5 games behind the Pirates. The next season McMillan was replaced by AAA Tidewater Manager; Joe Frazier. Berra went back to the A.L. New York club as a coach from 1976-1983. He then became manager there in 1984 getting fired the next season, after agreeing to take the job as long as he wasn't fired. He was let go 16 games into the season was so disgruntled, he disassociated himself with the club for 15 years.